Spiral bound. 160 pages. Polypropelene cover. Five piece scale rulers. Paper ballpoint pen. White lined paper. Product Size: 214 x 154mm. Product Packing: Bulk packed. 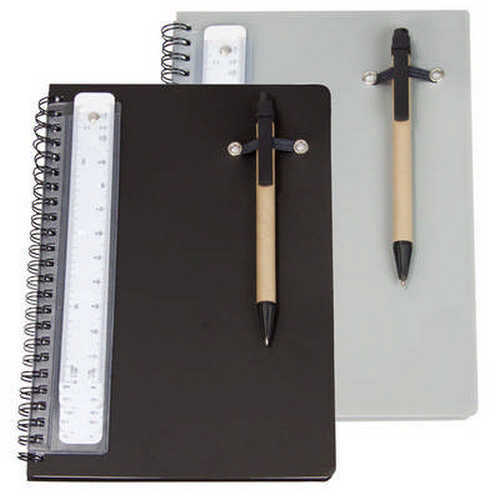 Decoration Size: Notebook 90 x 100mm, Pen 40 x 7mm. Decoration Position: Front cover. Decoration Method: Pad Print. Carton Quantities: 50. Carton Size: 50 x 23.5 x 22. Carton Weight: 11. Colour: Black | Silver. Price includes : Pad Print 1 Colour / 1 Position. Setup is included.